St Cuthbert, bishop of Lindisfarne (Holy Island), links the early and late middle ages in Britain, with the start of his career in the foundations and early history of Northeastern monasteries in the mid-7th century, the journey of his relics through several Northern centres during the Viking onslaughts of the 9th and 10th centuries, and enshrinement at the end of the 10th century at Durham, whence kings and churchmen, North and South, continued support of his cult. Beginning soon after his death (687), a sophisticated campaign promoted Cuthbert's holiness with works of art and literature, such as the Lindisfarne Gospels and accounts of his life. 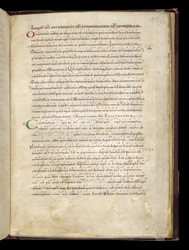 Bede wrote prose and verse versions, copies of which are in this manuscript. Often it is attributed to Canterbury because of its decoration's style, but a monastery in Wessex, such as Sherborne, has been suggested based on the contents of a prayerbook placed after its 'Lives' of Cuthbert. According to an inscription in the manuscript, it was written on the order of an abbot Wigbeorht, who cannot be identified. The prayerbook indicates that this manuscript was used in the prayer services (divine office) of a monastery. It begins with the hymns sung at vespers (evening prayers) on the day for the commemoration of the birth of St Cuthbert. The words of the songs are written in black, while the terms identifying them (such as 'a' for 'antiphon', 'pt' for 'psalm' or 'responsory') are written in red. Above each line, the music is written in Breton neumes, a system of notation from Brittany which was one of the most precise of the early middle ages although it is rare in Anglo-Saxon manuscripts.